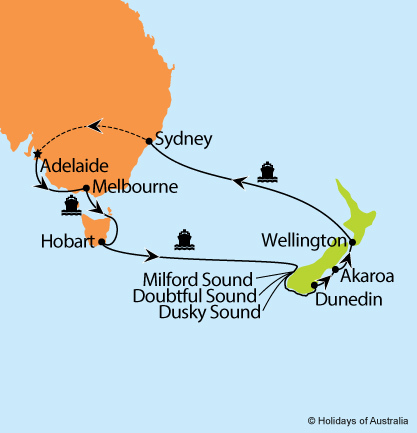 Breathtaking memories await you cruising New Zealand before touring the highlights of New South Wales and South Australia. Experience the award winning Radiance of the Seas, exploring all there is to offer at sea. Sail the Sounds of New Zealands captivating South Island. Immerse yourself in the stunning sights of the Blue Mountains. Comfort awaits your journey home aboard the Indian Pacific. 13 night cruise aboard Radiance of the Seas from Adelaide to Sydney with port calls in Melbourne, Hobart, Milford Sound, Doubtful Sound, Dusky Sound, Dunedin, Akaroa, and Wellington. Includes on board meals and entertainment. Transfer from the cruise terminal to your hotel with a half day Sydney City Sights tour. 4 night stay in Sydney at the Stamford Circular Quay including breakfast. Sydney Harbour Seafood Buffet Lunch Cruise. Full day Blue Mountain & Jenolan Caves tour. Transfer from your hotel to Sydney Central Station. 1 night aboard Indian Pacific from Sydney to Adelaide in Gold or Platinum Service. Includes all meals, drinks and an off train experience in Broken Hill.